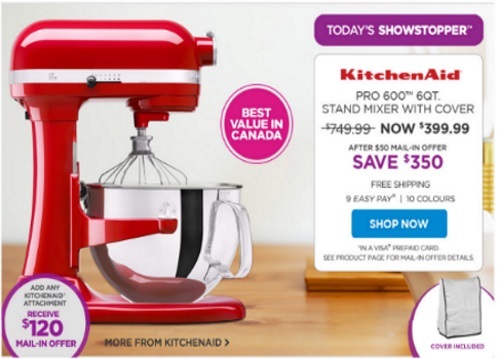 The Shopping Channel has a hot deal on the KitchenAid Pro 600 6qt Stand Mixer with cover for $399.99 (Regularly $749.99). This is the best value in Canada! Get a savings of $350 off the regular price (with $50 mail-in rebate). This item is available with 9 payments of $49.99. Shipping and handling is free. This offer is valid until 6:59am May 2, 2016 or while quantities last. Click here to shop this deal on The Shopping Channel.